During the visit, C4W was able to have one on one discussions with both the Deputy Premier and the Roads Minister to communicate our members views on the key priorities of the City adopting smart city strategies and technology to enhance the connectivity of our government services, community and businesses and accelerate the capacity of the City and the Bomen Industrial precinct in meeting the demands of a growth centre with a population of 100,000 residents. Our expectations on resolving long outstanding road infrastructure issues were shared with Minister Pavey in advance of our participation in discussions with NSW Transport, RMS and Wagga Wagga City Council next week. C4W members present at the announcement included Shaun Duffy (Great Southern Electrics), Darren Nelson (Enirgi), Richard Pottie (Ladex Constructions) along with CEO Alan Johnston. 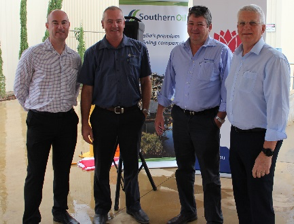 The visit saw the significant announcement of the Bomen Industrial Park being designated as a Special Activation Precinct (SAP), following the recent announcement of the first (SAP) at Parkes. This is significant in that it reduces government red tape for businesses looking to establish, relocate or expand their existing operations in the precinct. Congratulations to the staff at Wagga Wagga City Council for the considerable amount of work that has gone into achieving this designation as it will be a huge boost to expediting the benefits for the City from the Freight & Logistics Hub and associated industrial precinct. The community will also benefit from a grant from the Regional Growth Fund to expand and improve the infrastructure within the Botanic Gardens. The grant of $739,000 will be supplemented with a contribution from Wagga Wagga City Council in the order of $180,000.